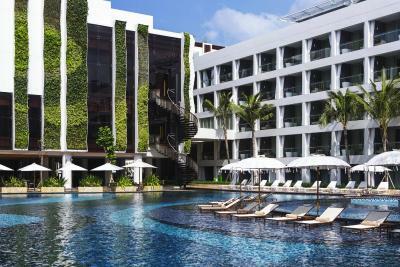 Lock in a great price for The Stones - Legian Bali, Marriott's Autograph Collection Hotel – rated 8.7 by recent guests! It is located very close to beach with good restaurants and cafes nearby. The pool bar was amazing. The buffet breakfast was delight. My stay was very pleasant. The staff was outstanding and very professional. The room was neat and clean. The pool and restaurant in the hotel was also very enjoying. The hotel staff was very friendly and engaged with guest. Safety is a top priority for them as they have a scanning system when coming into the hotel. The rooms we nice and modern, clean, and perfect. The breakfast was delicious with various selections to choose from. The pool area was amazing. The location is prime. The beach is across the street, walkimg distance to shopping and restaurants. I would highly recommend this hotel. we had problem with our credit card and the staff was kind enough to allow us to let us to check in while our friend is doing bank transfer from our origin country since we didn't have enough cash (USD3,200). The money went through hotel account just a day before we're checking out. the staff was very helpful. Staff were amazing, especially Astana and Pras, food was great. I wouldn’t stay anywhere else next time. The Stones - Legian Bali, Marriott's Autograph Collection Hotel This rating is a reflection of how the property compares to the industry standard when it comes to price, facilities and services available. It's based on a self-evaluation by the property. Use this rating to help choose your stay! 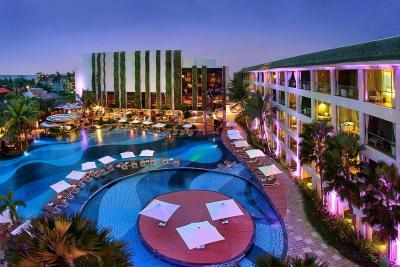 One of our top picks in Kuta.The Stones - Legian Bali, Marriott's Autograph Collection Hotel enjoys a beachfront location on the southern tip of Legian Beach. The 5-star hotel features a large outdoor pool with cabanas, sundeck and vertical gardens. Free WiFi is accessible in the rooms and throughout its premises. A 10-minute drive from The Stones - Legian Bali leads to the stylish Seminyak area. Beachwalk Shopping Center is only a 5-minute walk away. Pick-up service can be arranged from Ngurah Rai International Airport, a 20-minute drive away. Decorated in earth color tones, the rooms have large floor-to-ceiling windows that offer views of the garden or the pool. Every room is equipped with an espresso machine, iPod dock and a flat-screen TV. The private bathroom comes with rain shower facilities, hairdryer, slippers and free toiletries. 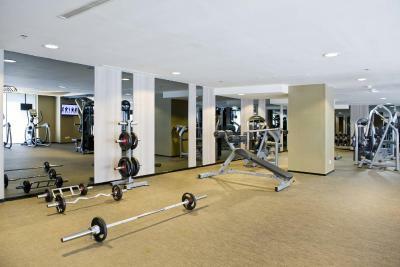 Leisurely afternoons can be spent relaxing in the Celestine Spa, working out at the GAIA Gym or lounging by the pool. Vehicle rentals and airport transfers can be arranged for guests’ travel needs. Guests also enjoy the convenience of on-site laundry service, business center and 24-hour front desk with luggage storage facilities. Union Pay is accepted here. Children will enjoy the Kids Club, free for the first 2 hours. Guests receive refreshing fruity popsicles upon check-in. Stone Kitchen serves a spread of international delicacies, while The Long Rice Table specializes in Indonesian cuisine and Big Fish Bar & Grill offers a variety of grilled seafood. Through room service, meals can be enjoyed in the comfort of guests’ rooms. When would you like to stay at The Stones - Legian Bali, Marriott's Autograph Collection Hotel? This twin/double room has a bathrobe, tile/marble floor and cable TV. This double room features a iPod dock, air conditioning and cable TV. This suite features a balcony, satellite TV and tea/coffee maker. This double room features a tile/marble floor, mini-bar and satellite TV. This twin room features a tile/marble floor, air conditioning and mini-bar. The Stones Hotel, Legian Bali, located at the Southern tip of Legian Beach, offers you the perfect vantage point to experience all that Bali has to offer. A short stroll to all the vibrant activity of Kuta-Legian. House Rules The Stones - Legian Bali, Marriott's Autograph Collection Hotel takes special requests – add in the next step! The Stones - Legian Bali, Marriott&#39;s Autograph Collection Hotel accepts these cards and reserves the right to temporarily hold an amount prior to arrival. The Stones - Legian Bali, Marriott's Autograph Collection Hotel accepts these cards and reserves the right to temporarily hold an amount prior to arrival. Not just here but all of Bali has service and govt tax should just be one price so you know what you are being charged , normal credit card charged at beginning but then they add the meals drinks etc to your room and charge again not just the difference so make sure your card can cope with two charges till the refund comes through we were told that it could take up to three weeks ??? Low range of leisure activities. Lack of desserts in breakfast menu. Polite staff. Clean rooms. Good indoor dining. The breakfast is good b. Lift was ages away from room. Aircon not in restaurant. Would be good if hotel was all inclusive. Also better aircon required in restaurant as very warm. The breakfast buffet was outstanding!!!! The pool and swim up bar was amazing!! Hotel style room was possibly a little small for a family of 3 for one week! Amazing pool area, the most wonderful, helpful staff. Awesome breakfast buffet with a donut wall that seriously impressed our daughter! Great location across from the beach - 10 minute walk to shopping center and markets. I expected more for a 5 star hotel. The room shows sign of ageing and simple things that a luxury hotel could easily fix. Like rusted coat hangers, marks on curtain, stain on blanket cover, linen were not crisp white (sign of over use of linen over many years), broken drawers, single serve of each tea flavour (I thought hotels serve in even numbers so couple can enjoy same tea flavour together), chipped bed frame, indoor thongs they provided was terrible (you can literally feel the bottom buttons) and floor tiles showing its age in dirt accumulation. For the price we paid, the rooms didn't feel luxurious. I have stayed in 3 star hotel that was much more inviting, comfortable and clean. Found the room without balcon and window , they are not convenience. The room was not that big and we believe bathroom was not present at right place because of which it become bit clumsy.